Optical Coherence Tomography (or, OCT) is often likened to an MRI or x-ray as it is a sophisticated scanning system that produces highly detailed images of the retina (the light-sensitive tissue lining the back of the eye). It is non-invasive and uses light waves only to produce a cross-section image of your retina. It is often referred to as a ‘3D Eye Scan’. This scan allows us to see detailed images of the retina (the innermost layer of the interior eye), enabling us to accurately detect, monitor and control changes to the retina. This procedure is currently the only one that shows in-depth images of the eye’s internal structures. Other procedures only show the surface of these structures. OCT is also useful in detecting disorders of the optic nerve (the collection of nerve fibres which send signals from the retina to the brain). The OCT exam can determine if there have been changes to the fibers of the optic nerve, such as those caused by glaucoma. Most people experience a change in their vision by the time they reach their early 40s. This can be a mild change in normal vision do to changes in the structure of the eyeball consistent with normal ageing or it could be a symptom of something more serious. With OCT we can generate a highly detailed 3D image of the retina which will allow us to have a better view of your eye health. As optometrists our biggest ally in the treatment of vision impairment is early detection. In fact, up to 80% of vision impairment and blindness can be prevented by early detection. With OCT we can see each of your retina’s distinctive layers which we measure and map for thickness which help us assess the health of your retina. These measurements can reveal abnormalities and help us to detect diseases of the retina such as age-related macular degeneration and diabetic eye disease. 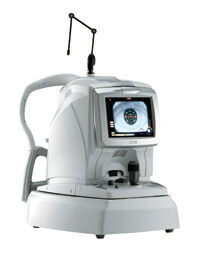 Having an accurate image of your retina also allows for a treatment plan to be tailored to your specific requirements. Optical Coherence Tomography is perfectly safe and can be performed in around 10-15 minutes. The optometrist may use dilating eye drops in your eyes which widen your pupil to produce a better scan in the OCT. You will be seated in front of the OCT machine with your head rested on a support that keeps it from moving. The equipment will not be touching your eyes and will produce a 3D image of your retina in less than 15 minutes. After examining the scans the optometrist will discuss the results with you and we store the scans in your records to compare the images with future images of your retina. There are many conditions of the eye which can be diagnosed with the help of an OCT exam. Serious eye disease can develop in the retina as we age as these are often not visible on the surface of the eye and may not exhibit physical symptoms. Early detection is our best ally in treating these diseases and OCT is the best way to monitor the health of your retina. The OCT exam is very useful in helping us determine if there have been changes to the fibers of the optic nerve, such as those caused by glaucoma. OCT is not used to detect conditions that interfere with light passing through the eye (such as dense cataracts or bleeding in the vitreous) since it relies on light waves to generate a 3D image of the retina. When Should I Have An OCT Exam? For people over the age of 50 we recommend bi-annual screening since this is the age group most at risk of diseases of the retina. Early detection is paramount to successful treatment of most disorders of the retina. For those under the age of 50 we recommend an OCT exam as required based on the initial eye examination. However, if you are experiencing any of the symptoms listed below, please call us or contact us through the website to book an appointment for an eye exam today. Seeing ‘dark’ or ‘empty’ patches in the centre of your vision.